First day back in London for 2 and a half weeks. I was feeling so much heavier I was worried my trousers wouldn’t fit. They were snug but OK. I think I put 4 pounds on so not great but not a complete disaster. 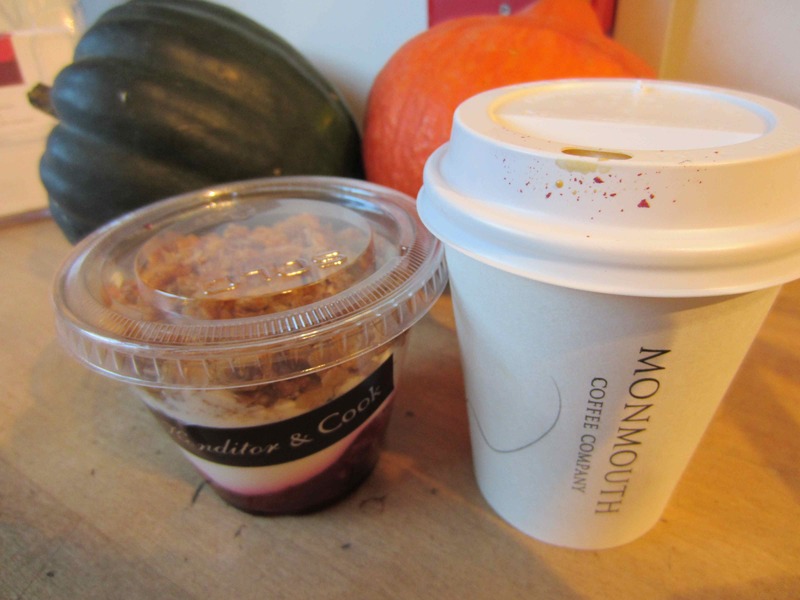 I was glad to have my old faithfuls: a Monmouth coffee and sour cherry granola. There were so many things I liked about Florida but coffee was not one of them. I dislike filter coffee which is predominantly what Americans seem to drink and the lattes I had were not on a par with European ones. I even resorted to Starbucks twice which is always my last choice here. Monmouth did not disappoint. They are opening some of the stalls in the Green Market section of Borough Market Mondays – Wednesdays so I walked there at lunch time to support those hardy stall holders, standing there in this freezing weather we are having. There was a new Falaffel company there – Hoxton Beach. This was excellent. The pink sticks are raw turnip, pickled lightly with beetroot which worked well. Also served with Tahini, chilli sauce, lemony humous and salad vegetables. I then couldn’t resist another Monmouth coffee and a Brownie. Yes I had a Monmouth Brownie which was very naughty. Oh my, they are so good though. It was dark so early today. 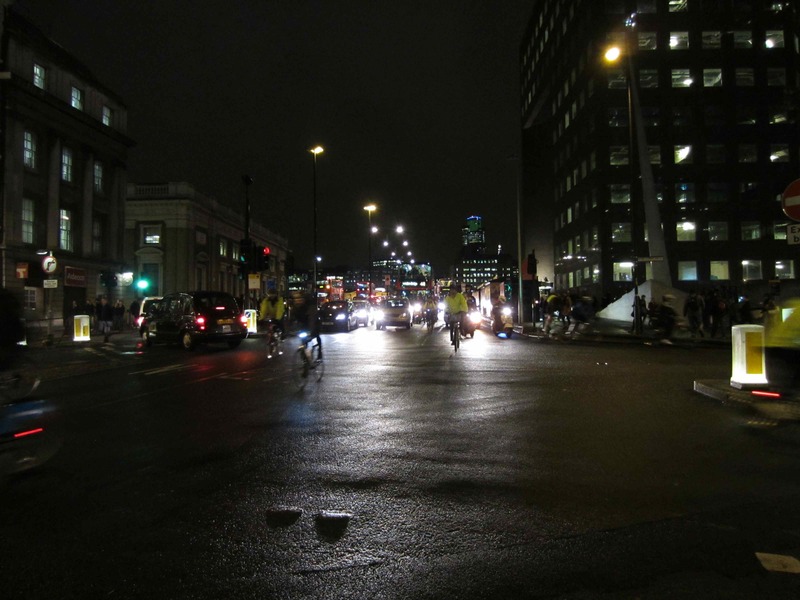 I didn’t leave work until 6:30 pm and it was dark, crowded, noisy, busy and cold on London Bridge. Waaaahhhhhh!!!!! Take me back to the warm, sunny and light Keys. I brought some of the Keys home and needed it tonight. 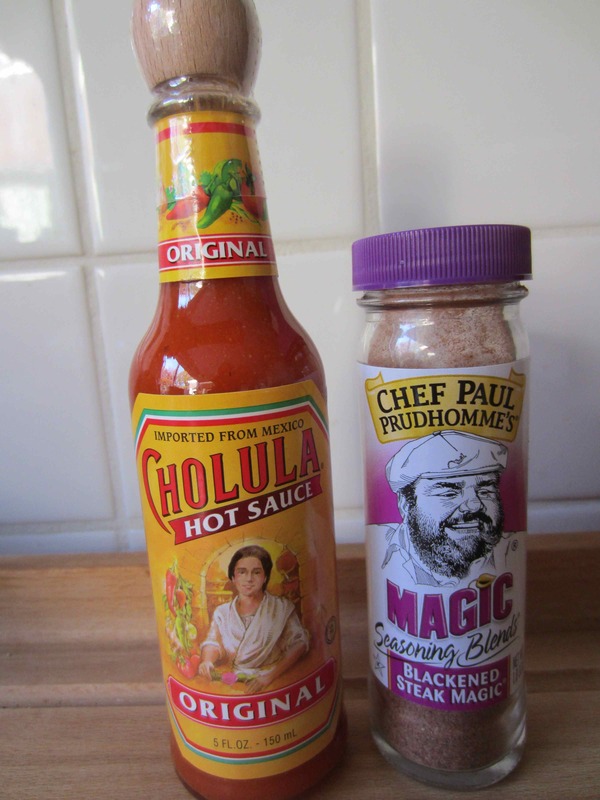 Cholula! A wonderful pepper sauce which has all the tangy peppery flavour I love but not the nasal stripping heat I don’t always want. We were recommended this in Mangrove Mike’s. The other jar is the blackened spice mix I used on Sunday’s chicken and which you can get here. Sainsbury’s sell it and I highly recommend it. 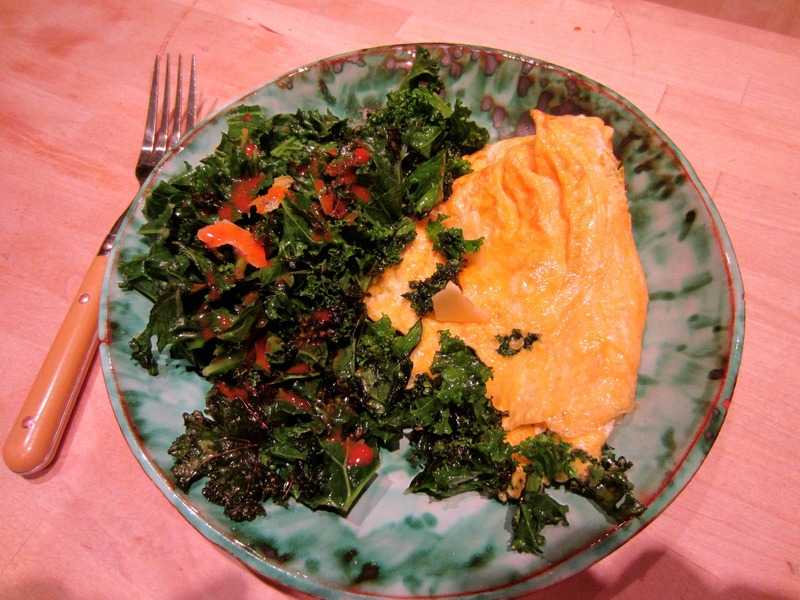 Kale and a cheddar omelette with Cholula. It was good but it would definitely taste better in the Keys. 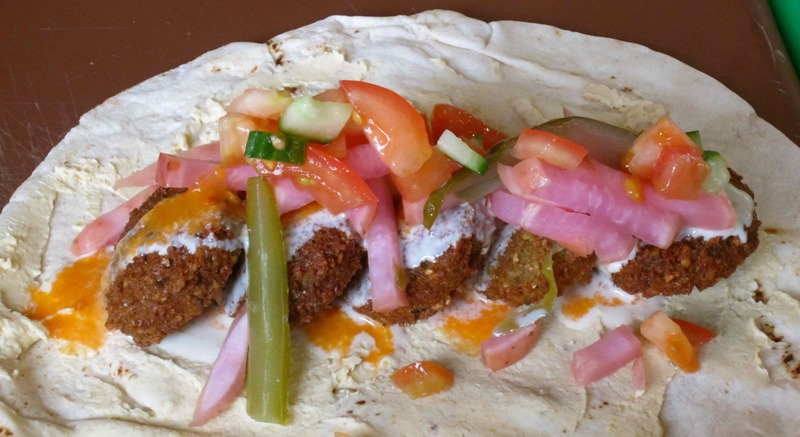 This entry was posted in Diet Struggles and tagged Eggs, Falaffel, Granola, Humous. Bookmark the permalink. May the rest of your week get easier as you make the transitions in time and weather and definitely the amount of daylight. Today, November 6, 2012 we are at the half way mark of the first day of Fall and the Winter Soltice. Only 6 more weeks until the days start getting longer! Today was easier than yesterday. Thank you for the only 6 weeks observation – that makes it sound more manageable! Your eating today November 7, sounded great. So, you walk off the Snicker bar tomorrow. Just remember they add up. ☺ Like you didn’t know that!! !